Yes, although there is a maximum number of guests you are allowed, in addition to your standard cabin rate of people. You are welcome to have a maximum of four in a lodge room, six in a two-bedroom cabin, and eight in a three-bedroom cabin. When occupancy exceeds the standard cabin rate (2 for lodge room, 4 for a two-bedroom cabin, 5 for a three-bedroom), extra-person charges are calculated based on the ages of your additional guests. Sorry, we do not allow pets at camp. We can accommodate two ski-boats per week. We allocate spots on a first-come, first-served basis through the reservations department. If you bring a boat, you will have to park your trailer at our Town Office located about seven miles from Camp. You can download the “Bringing a Boat” form. Sometimes guests bring a special kayak or sailboat. We have a large fleet of vessels available for check-out at no extra cost. Before the launching of any motorized or non-motorized vessel, you must have your boat checked out by a certified Invasive Aquatic Species Inspector. This can be arranged at the Fallen Leaf Lake Marina or by the Camp Director. Please let us know in advance if you plan on bringing any type of vessel to Camp. Cash and check are the only accepted methods for payment; we do not take credit cards. Any incidental purchases at Camp can be put on your room account for final payment at the end of your stay. All checks should be made out to SAA-Sierra Programs. We do not have an ATM. The nearest ATM is located in South Lake Tahoe, approximately eight miles away. The nearest major airport is the Reno Tahoe International Airport in Reno, Nevada. Most guests take the South Tahoe Express from the Reno airport to the Lakeside Casino in South Lake Tahoe. Be sure to exit the shuttle at the Lakeside Casino; a Sierra Camp shuttle van will bring you and your family to Camp. Reserve the South Tahoe Express at the airport or online at http://www.southtahoeexpress.com/ Arrange your shuttle pickup from the Lakeside Casino to Camp with the Camp reservations staff at least two weeks prior to your arrival. We need to know the flight number, flight times, the number in your party, and your shuttle arrival time. Let us know if your flight changes, as we arrange the shuttle based on guest request. The South Lake Tahoe Airport although closer, does not host any commercial airlines. Do you provide for vegetarians and vegans? Meals are served buffet style and include a wide variety of healthy selections. Breakfast hosts a variety of fresh fruits, breads, cereals plus hot vegetarian and meat options. Fresh fruit, vegetables, and salad-makings are available at lunch and dinner, plus fresh-baked breads, and savory vegetarian and traditional entrees. Please note vegan or other dietary restrictions on your reservation information. Our Chef and his staff work to accommodate your dietary needs and will gladly make a special dish if our main selections do not work with your unique diet. A bag-lunch sandwich bar is available daily for hikers and adventurers. Summer weather at camp can be unpredictable. Daytime temperatures are usually in the low to mid 80s. Temperatures drop dramatically in the evening to as low as 35 degrees Fahrenheit. We suggest bringing layers including long sleeves and pants. Check the current weather at Fallen Leaf Lake. What are your parking facilities? Parking is very limited. We have space for one car per cabin/reservation. Families with more than one car are asked to park additional vehicles at our off-site Town Office approximately seven miles from Camp. Please park your vehicle in our back lot to keep Camp feeling more natural – vehicles are not allowed to park in any turnout spaces. Can guests visit us for a meal? Yes. Please tell the office staff prior to your guests’ arrival, so your guests can sign a waiver form and be included in the day’s meal head-count. You can add the charges for drop-in meal guests to your bill or pay at the office by cash or check. Out of consideration for your fellow Campers, drop-in guests may not use camp equipment or participate in camp programs. Staff are occasionally available to babysit between shifts. The suggested rate is $15 per child per hour, and $5 per hour for each additional child. At Camp, you can fill out a babysitter request form at the office. Any interested staff will respond with a note on the guest bulletin board. Do you provide an early check-out? Early check-out is available for guests who sign-up by noon on Friday. Bill-settling can be done between 3 and 6 pm on Friday afternoon. Any purchases after this time must be made by cash or check. All other campers can check-out Saturday morning between 8 and 10 am. Can my child be in a different kids group than what the age designation determines? We do not allow children to switch out of designated age groups. Munchkins are 3-4 years old and potty-trained, Snoopers are 5-6 years old, Menehunes are 7-8 years, Yahoos are 9-10 years, Midorees are 11-12, Suaves are 13-14 and Teens are 15-18 (up to high school graduates). If a child “advances” age groups, they’ll want to keep “advancing” as they grow older. Once one exception is made, there is potential for many exceptions, which then makes it extremely difficult to enforce guidelines. Due to this complication, we choose to remain firm with each age range and do not allow switches. We also stay strict by the guideline that all Munchkins must be at least three years old AND potty-trained for all parts of our summer program (including Microbopper Week). I know that going to Camp means “getting away from the outside world,” but what if I need to stay connected? Phones: Most guests find cell service very limited at Fallen Leaf Lake. Camp has three public phones for guest use with phone card. The three phones are data-port phones. There are no phones in the guest rooms. Computers: Our business center, the Jabu Room, has four personal computers for adult-guest use. There are two Ethernet outlets available as well. Other guests with laptops will be glad to know that T1 wi-fi is available in most areas of the Main Lodge & cabins. Fax: You may send and receive faxes to our main office for an additional fee. The fax number is (530) 541-2212. Please have your name clearly written on the fax. If it’s to be received at Camp prior to your arrival, have the sender note your week number—we’ll keep it on file for you. Messages: Friends and family are welcome to call our main office to leave messages for you. Messages are posted on the guest message board outside the front office. Have friends or family call (530) 541-1244 to leave a message. Our office is open from 8am-12pm, and 1pm-10pm. Between 10pm and 8am, our night watchman will check messages and hand deliver anything urgent. News: There are no televisions in Camp. Many cabins have clock-radios for public radio. You can sign-up for daily newspaper service for an additional charge at the office upon arrival if you forgot to do so with your registration paperwork. Mail: Mail will be posted on the guest message board when it arrives. USPS address is PO BOX 10618, South Lake Tahoe, CA 96158. 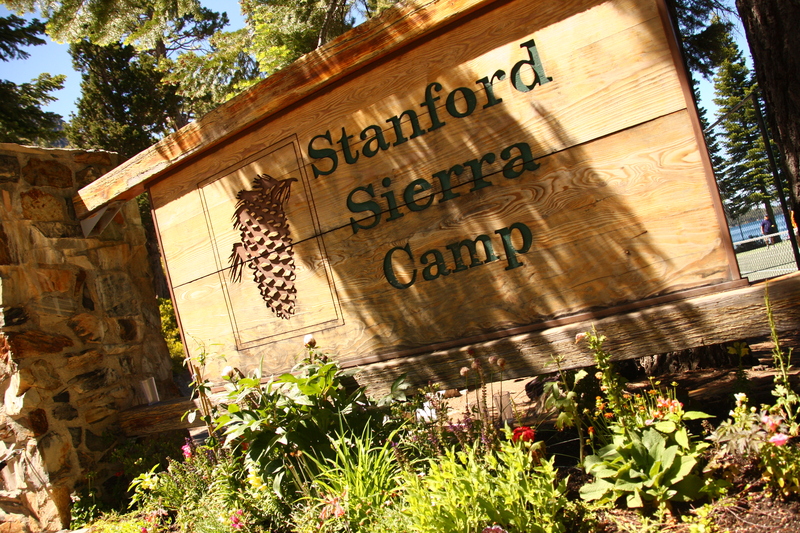 If you must ship something via UPS or FedEx to our physical address, please write your name, week number, and Stanford Sierra Camp, 130 Fallen Leaf Rd, Fallen Leaf, CA 96151. If you have requests for items that you would like to be purchased in town (toothpaste, baby diapers, disposable cameras, etc), we have a daily town run service to accommodate your needs. Please submit your town run request at the front office before 10am with enough cash (cash only, no checks or cards) to pay for your item. Change will be returned to you with your item.